Last week, two good assets were published to the social web that explain how to build a new user interface on top of our cloud IBM Connections deployment using the APIs and OAuth. With IBM Connect 2014 just around the corner (6 more weeks! ), that would be a great opportunity to showcase your work or your app integrated with our social platform. Looking for ideas on where to start? Here's a couple of thoughts. First, this presentation on SlideShare walks through building a customer support interface with workflow where they can ensure that the internal support team avoids having multiple people work on the same task/item. It also separates internal discussions from external users. As I mentioned yesterday, tomorrow is the last day to take advantage of the Early Bird discount for IBM Connect 2014. If you are wondering about which sessions we'll be presenting, you can use the Session Preview tool and look at the 320+ sessions that are happening (including my 2 sessions which are already in your agenda, right?). Half of those are specifically related to social! Moreover, what you'll find is not only a great list of session topics and abstracts, but the best IBM, customers and partners are going to be there to share their knowledge and help you be successful! Need yet another reason to attend IBM Connect 2014 ? Scott Adams, creator of the world renowned "Dilbert" comic strip, takes center stage at IBM Connect 2014 in Orlando on Tuesday, January 28. Using his book, How to Fail at Almost Everything and Still Win Big, as a backdrop, Adams will illustrate how his failures contributed to his success. You don't want to miss his inspiring story – how he’s energizing his life's work and delivering better business outcomes. Register today. Ronnie also wants you to come! A couple of days ago, I got confirmation that I'm going to be going to IBM Connect 2014 ! We are about 6 weeks away to start IBM Connect 2014, the premier social business conference. Earlier this morning I completed the registration process and booked my hotel. My level of excitement is extremely high!!!! I can't wait to start 2014. What's New and Coming in IBM Connections - I'll get the opportunity to present the roadmap for IBM Connections and talk about what we are delivering in the cloud and on-premises. If you are interested in learning and seeing what's coming in the world wide market leading social business platform, you can NOT miss this session. New Ways to Work With Your IBM Connections Communities - This one is in the App Dev track and will be tailored for those techie people interested in using IBM Connections as a platform to build apps and extend or add collaboration capabilities. Communities in Connections are the hub for team collaboration and it's now the most used feature of Connections. In the next week or so, I'll be posting the list of all the sessions that are related to social so that you can start planning your agenda. If you haven't registered for IBM Connect 2014, what are you waiting for? Register today, early bird discount expires in 2 days! See you there. 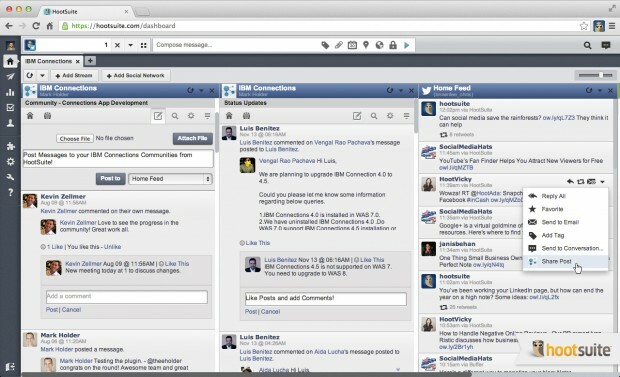 HootSuite has just announced the private Beta integration with IBM Connections platform. This is an incredible combination of two leaders: HootSuite is the leading social media management system with nearly 7 million users. IBM Connections is the worldwide enterprise social software marketshare leader according to IDC for 4 years running. Needless to say, I'm excited to see our eco system continue to grow with market leaders such as HootSuite integrating with IBM's social platform. This is just one of the many solutions we'll be talking about at IBM Connect 2014, so if you haven't registered yet, go do it now and take advantage of the early bird discount! Hootsuite and IBM Connections users will be able to integrate content from IBM Connections into the HootSuite dashboard so it can be viewed and actioned alongside social media data from Facebook, Twitter, LinkedIn, and other social networks and applications. This IBM Connections integration is the first of its kind, no other platform brings your corporate social streams within IBM Connections and public social media together as efficiently. If you are interested in learning more, check out HootSuite's blog for instructions on how to apply for beta access. This integration is available at no additional cost.